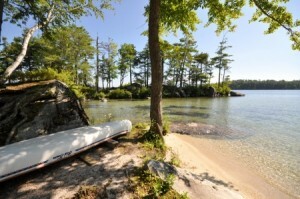 Some of the most beautiful sand beaches on Lake Winnipesaukee are featured on my website. My new listing at 128 Veasey Shore Road, Meredith has a white sugar sand beach and a boathouse built over the water! This 1929 refurbished boathouse has 2 bedrooms, screened porch with fireplace, kitchenette and additional rooms including a living room with a fireplace. Grace Kelly summered here years ago before the current 7 bedroom home was built here on this 2.1 acre parcel. Ask about my listing "Hornets Nest Point" a Meredith NH luxury estate property with one of the premier sand beaches on Lake Winnipesaukee. (Pictured above is one of the beaches at Hornet's Nest Point at 102 Veasey Shore Road.) VIEW NEW 07/30/2011 slideshow of many beach photos of the meandering, white sand beaches at Hornet's Nest Point. (Exterior house photos only and Interior photos of Carriage House and workshop also included in this slideshow.) This stunning estate property with some of the most distinctive beaches on the lake is now offered at nearly forty percent off the original listing price. Contact me if you'd like to set up an appointment to tour Hornet's Nest Point. Hornet's Nest Point is offered with just the luxury estate home, carriage house, boathouse, and one lot of record with 300 feet on Lake Winnipesaukee. It is also offered as MLS# 4027202, the same estate offering with an additional 2 lots of record, including 2 sandy beaches. Other Lake Winnipesaukee homes or land for sale with wonderful sand beaches include my listings on Powers Road, Meredith (now pending sale), Blackey Cove Road, Moultonborough, 22 Cattle Landing Road, Meredith, and 115 Windermere Road, Moultonborough, NH. Contact me if you have questions....or if you'd like to set up an appointment to view Lake Winnipesaukee homes with sand beaches.